This week’s movie, the low-budget Australian shark thriller Bait 3D, comes to us as a special recommendation by a very significant member of the Beyond The Box Set family. As long-time listeners will know, Harry’s mother and her… unorthodox taste in family-friendly movies have had a major impact on this podcast, and quite possibly on her son’s psychological profile. As a former mobile librarian, whatever weird, wonderful and often deeply inappropriate movies found their way into circulation on the mid-Wales DVD rental scene would often end up as family viewing. From the disturbing sci-fi horror Sunshine to the ultra violent Jude Law gangster flick Dom Hemingway, some of the most interesting movies we’ve covered on Beyond The Box Set were inspired by Harry’s unsettling family viewing experiences. Directed by Australian punk rocker Kimble Rendall, Bait 3D is in many ways a classic shark movie. 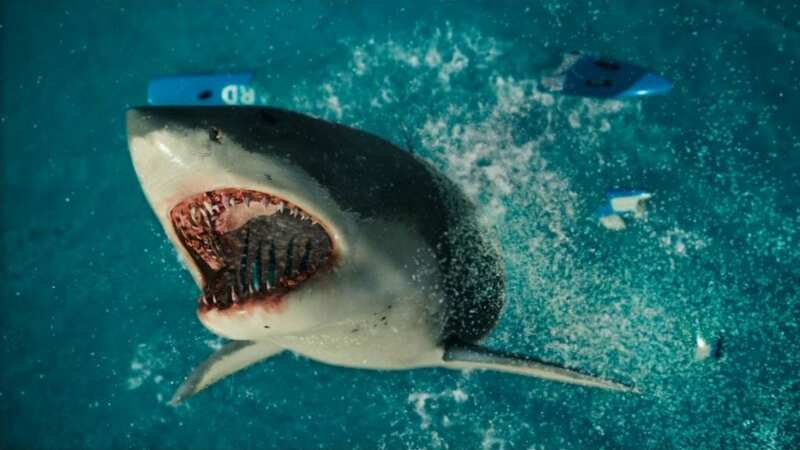 After a freak tidal wave ravages an Australian beach resort, a group of survivors find themselves trapped in a flooded supermarket with at least one very hungry Great White Shark. The acting is wooden, the special effects are unconvincing and the movie’s grasp of basic physics is questionable at best, but it’s a brisk, entertaining ride that manages to wring more laughs and genuine jump scares out of the conceit than many better known examples of the genre. Our Bait 3D episode is available for free streaming and downloads on all good podcasting platforms – just follow the links at the top of this blog post or search ‘Beyond the Box Set’ on your preferred podcatcher. You can also find us on social media on Facebook, Twitter and Instagram, and we have a number of special VIP incentives over on our Patreon page for fans who enjoy us and want to get a little closer to the show. Next week, we’ll be featuring something a little better known – one of the greatest comedies of the past thirty years, in fact. Until then, happy listening and stay out of the water!